Most investors tend to think that hedge funds and other asset managers are worthless, as they cannot beat even simple index fund portfolios. In fact, most people expect hedge funds to compete with and outperform the bull market that we have witnessed in recent years. However, hedge funds are generally partially hedged and aim at delivering attractive risk-adjusted returns rather than following the ups and downs of equity markets hoping that they will outperform the broader market. Our research shows that certain hedge funds do have great stock picking skills (and we can identify these hedge funds in advance pretty accurately), so let’s take a glance at the smart money sentiment towards Carnival Corporation (NYSE:CCL). Carnival Corporation (NYSE:CCL) investors should pay attention to an increase in hedge fund interest recently. Our calculations also showed that CCL isn’t among the 30 most popular stocks among hedge funds. In the financial world there are a lot of methods market participants can use to assess publicly traded companies. Two of the best methods are hedge fund and insider trading sentiment. Our experts have shown that, historically, those who follow the best picks of the elite investment managers can trounce the S&P 500 by a significant margin (see the details here). We’re going to take a peek at the key hedge fund action regarding Carnival Corporation (NYSE:CCL). What does the smart money think about Carnival Corporation (NYSE:CCL)? At Q4’s end, a total of 39 of the hedge funds tracked by Insider Monkey were long this stock, a change of 8% from one quarter earlier. 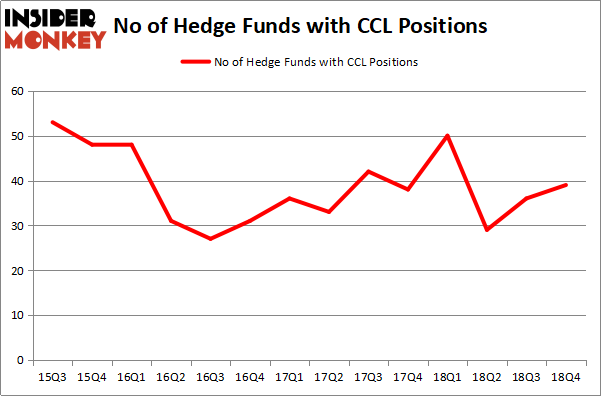 The graph below displays the number of hedge funds with bullish position in CCL over the last 14 quarters. With the smart money’s positions undergoing their usual ebb and flow, there exists a select group of key hedge fund managers who were upping their holdings meaningfully (or already accumulated large positions). More specifically, Two Sigma Advisors was the largest shareholder of Carnival Corporation (NYSE:CCL), with a stake worth $210.1 million reported as of the end of September. Trailing Two Sigma Advisors was Millennium Management, which amassed a stake valued at $157.3 million. GLG Partners, AQR Capital Management, and Marshall Wace LLP were also very fond of the stock, giving the stock large weights in their portfolios. Consequently, some big names were breaking ground themselves. Arrowstreet Capital, managed by Peter Rathjens, Bruce Clarke and John Campbell, assembled the largest position in Carnival Corporation (NYSE:CCL). Arrowstreet Capital had $46.5 million invested in the company at the end of the quarter. Jim Simons’s Renaissance Technologies also made a $40.9 million investment in the stock during the quarter. 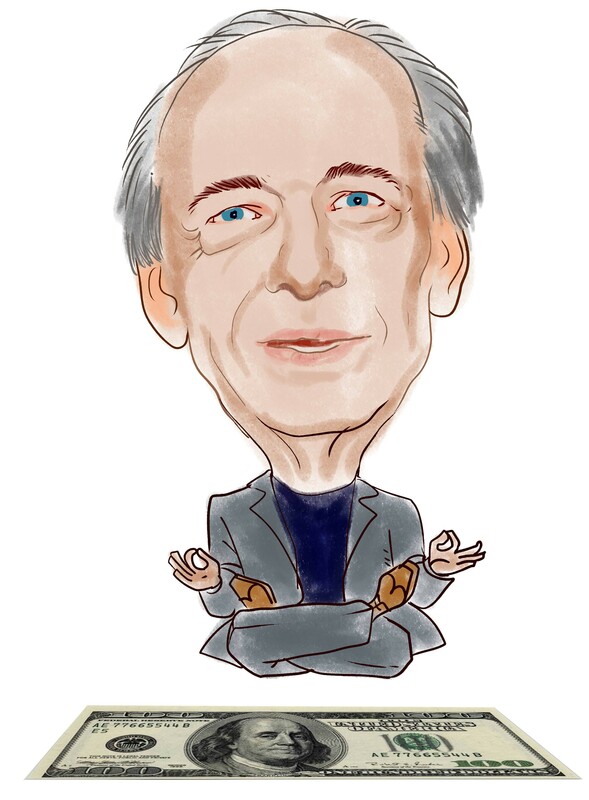 The following funds were also among the new CCL investors: Ray Dalio’s Bridgewater Associates, Richard Barrera’s Roystone Capital Partners, and Glenn Russell Dubin’s Highbridge Capital Management. Let’s check out hedge fund activity in other stocks – not necessarily in the same industry as Carnival Corporation (NYSE:CCL) but similarly valued. These stocks are Micron Technology, Inc. (NASDAQ:MU), Activision Blizzard, Inc. (NASDAQ:ATVI), BCE Inc. (NYSE:BCE), and Public Storage (NYSE:PSA). This group of stocks’ market caps are closest to CCL’s market cap. As you can see these stocks had an average of 38.5 hedge funds with bullish positions and the average amount invested in these stocks was $1650 million. That figure was $910 million in CCL’s case. Micron Technology, Inc. (NASDAQ:MU) is the most popular stock in this table. On the other hand BCE Inc. (NYSE:BCE) is the least popular one with only 16 bullish hedge fund positions. Carnival Corporation (NYSE:CCL) is not the most popular stock in this group but hedge fund interest is still above average. Our calculations showed that top 15 most popular stocks among hedge funds returned 19.7% through March 15th and outperformed the S&P 500 ETF (SPY) by 6.6 percentage points. Hedge funds were also right about betting on CCL, though not to the same extent, as the stock returned 15.8% and outperformed the market as well. Is Illinois Tool Works Inc. (ITW) A Good Stock To Buy? Were Hedge Funds Right About Dumping FedEx Corporation (FDX)? Were Hedge Funds Right About Selling Northrop Grumman Corporation (NOC)? Is Vertex Pharmaceuticals Incorporated (VRTX) A Good Stock To Buy? Were Hedge Funds Right About Ecolab Inc. (ECL)? Were Hedge Funds Right About Getting Into Bank of Montreal (BMO)?